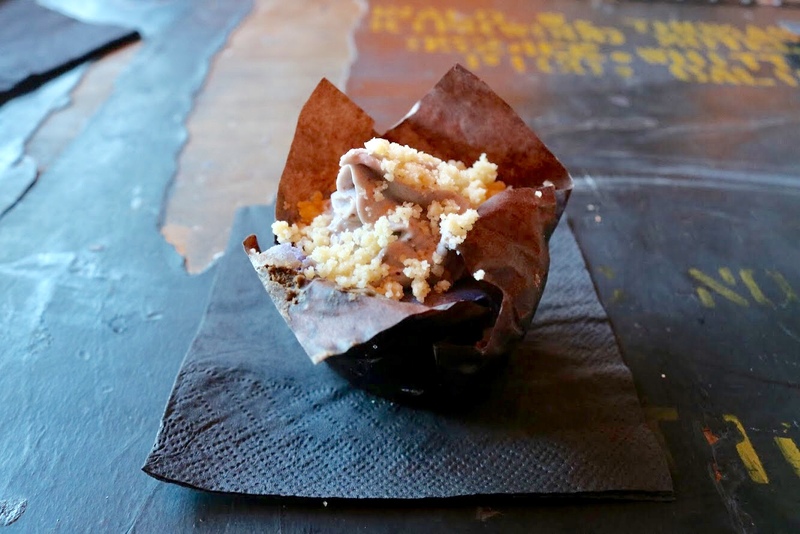 Unlike other cafes or boba shops, Café 86 offers a whole array of desserts that incorporate ube. The quick service and calm atmosphere makes it a perfect place to hangout with friends. 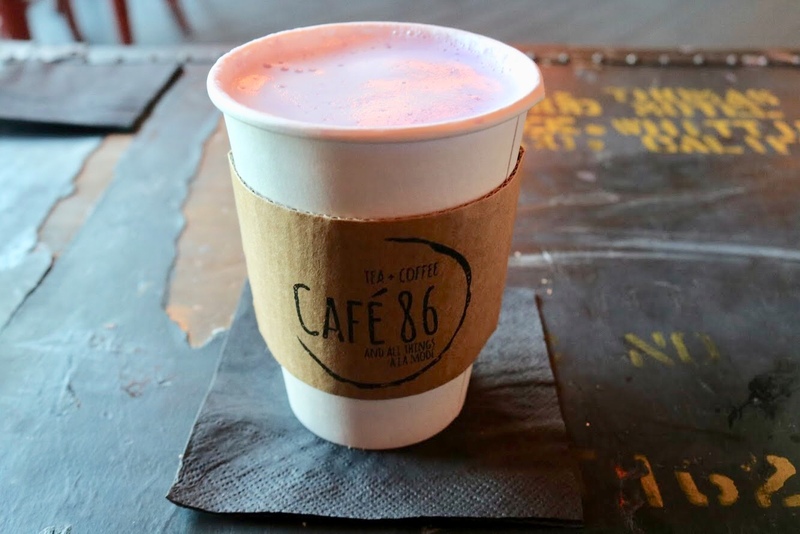 As a boba fanatic and ube lover, I came across Café 86 while searching on the internet for different cafes to hang out and study at. I glanced at the cafe’s Instagram page and saw an array of colorful drinks and pastries, which made me crave the desserts more than I already did. Originating in Chino, CA, Café 86 opened up their newest spot here in Las Vegas. As I walked in, I was surrounded by an industrial-esque theme. Hanging lights rained down from the ceiling, wooden shelves propped up license plates and their pastry display case full of desserts immediately caught my eye, like it was love at first sight. I could also hear Bryson Tiller’s music playing over the speakers, giving the environment a chill, low-key vibe. While my friend and I ordered our desserts and drinks, the cashier was easily able to answer the questions I had about some of the pastries. In the corner of my eye, I saw a blob of purple from the mound of ube desserts in the display case tempting me to order more items. The first item I tasted was the Kouki Monster ($5.49), an ordinary cookies and cream milkshake or slushy. The inner Asian in me decided to ask for boba in the drink for an additional 50 cents and I must say that it was worth it. I was able to taste more cookies than the cream itself, something I enjoyed. The soft chewy boba and bits of crunchy Oreos added a variety of texture to the drink making it even more enjoyable. The Ube Latte ($4.40) was everything I expected. There was a subtle purple tint to the drink, distinctive of ube and silky smooth. The drink exuded the familiar purple yam flavoring that I have grown to love. However, the seafoam-like layer floating on top toned it down. Despite the word ‘latte’ in the name, I was not able to taste any coffee in the drink. Continuing on the journey to becoming the purple yam king, I tried Ube Butter Bar ($3.25) and the Ube Crack Cheesecake ($3.50). 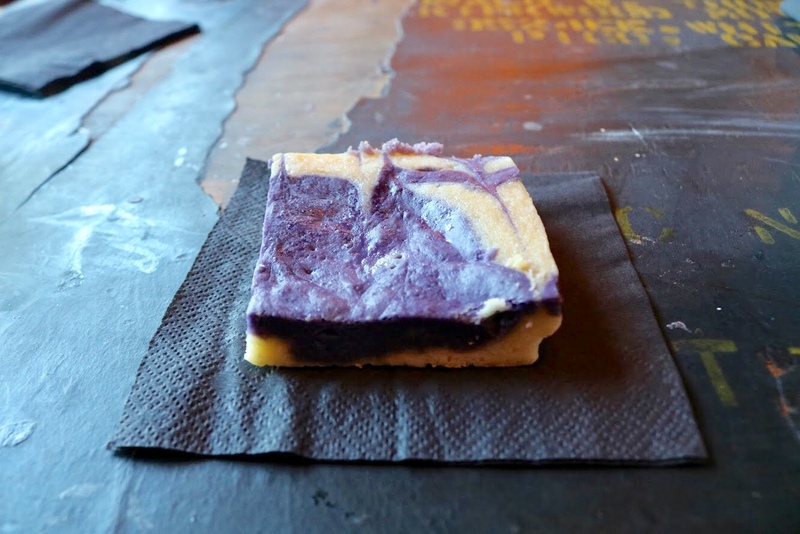 These two items tasted pretty similar to each other, but the Ube Butter Bar had a stronger ube flavor. 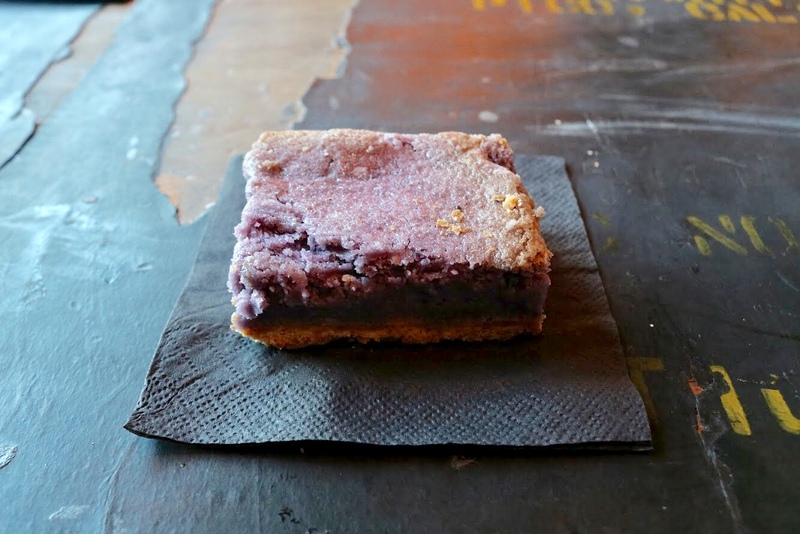 The butter bar consisted of a rich, smooth layer of ube goodness on top and a thin graham cracker base. The creamy ube portion of the bar balance the crunchy bottom layer. On the other hand, the Ube Crack Cheesecake let me down. It tasted like a normal New York cheesecake, but had purple facade attempting to portray its “ube” title. My favorite item was the White Chocolate Ube Bar ($2.75). The white chocolate was intensely creamy and made me think I was drinking straight out of a cow’s utters. The ube flavoring was a little more overpowering than the white chocolate, but I was still able to enjoy it. If you’re an ube lover, I highly recommend trying the purple yam-infused drinks and desserts at Café 86. Although the café does serve numerous ube items, they also have a variety of coffees, teas, slushies and milkshakes at a good price. 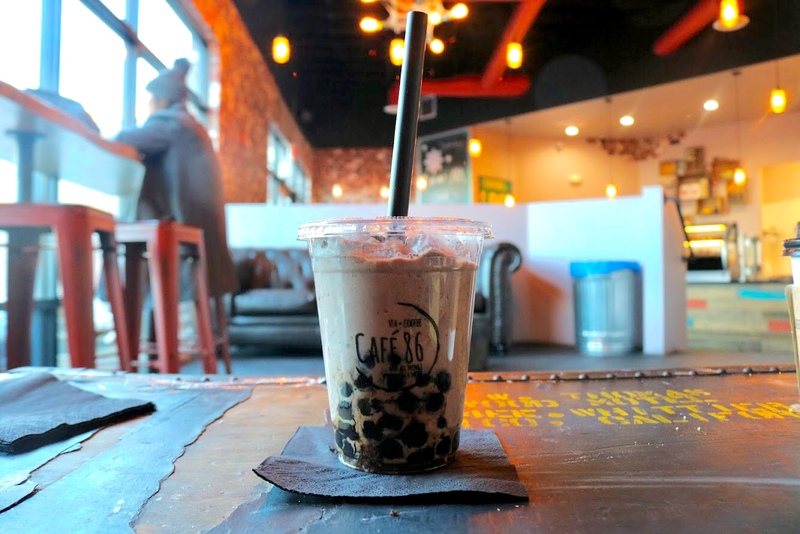 The café is also an ideal place for anyone wanting to study or hang out with friends as the atmosphere is relatively calm–just as any boba place should be. No, I'm not a fan of the purple yam.